Spring ephemerals and the word "badass" are probably not frequent associates but I am here to argue that they should be. Spring ephemeral season is here for some and just around the corner for the rest of us. It's my favorite wildflower season and I often go missing in the woods for those first few weeks of spring. It is easy to look at their diminutive size and their ephemeral nature as signs of delicacy but these plants are anything but. In fact, when one examines the intricacies of their lifestyle, they can see that spring ephemerals make most other plants look like total softies. Spring ephemerals, the designation of which gets blurred depending on who you ask, have to complete most of their life cycle in the early spring before the trees and understory shrubs leaf out and completely take over most of the available light. This is an incredibly tough time to be a plant. Soil temperatures are low, which makes nutrient and water uptake a difficult task, all but the most robust pollinators are still sound asleep, and there is the ever present danger of a hard frost or freak snow storm. These factors have led to some incredible adaptations in all of the species that emerge around this time. Whereas each species has its own methods, there are some generalities that are common throughout. For the most part, spring ephemerals have two distinct growth phases; epigeous (above ground) and hypogeous (below ground). The hypogeous phase of growth takes place throughout fall and winter. Yes, winter. This is the phase in which the plants put out more roots and develop next season’s buds. This goes on at the expense of nutrients that were stored the previous spring. Once spring arrives and soils begin to warm, the plants enter the epigeous phase of growth where leaves and flowers are produced and reproduction occurs. This is an incredibly short period of time and spring ephemerals are well suited for the task. For starters, photosynthetic activity for these species is at its best around 20 °C. Photosynthetic proteins activate very early on so that by the time the leaf is fully expanded, the plant is a powerhouse of carbohydrate production. Photosynthesizing in cool temperatures comes at a cost. Water stress in at this time of year is high. Low soil temperatures make uptake of water difficult and it is strange to note that many species of spring ephemeral have very little root surface area in the form of root hairs. These species, however, have extensive mycorrhizal associations which help assuage this issue. Nutrient availability is also very limited by low soil temperatures. Chemical reactions that would unlock such nutrients are not efficient at low temperatures. Again, spring ephemerals get around this via their increased mycorrhizal associations. 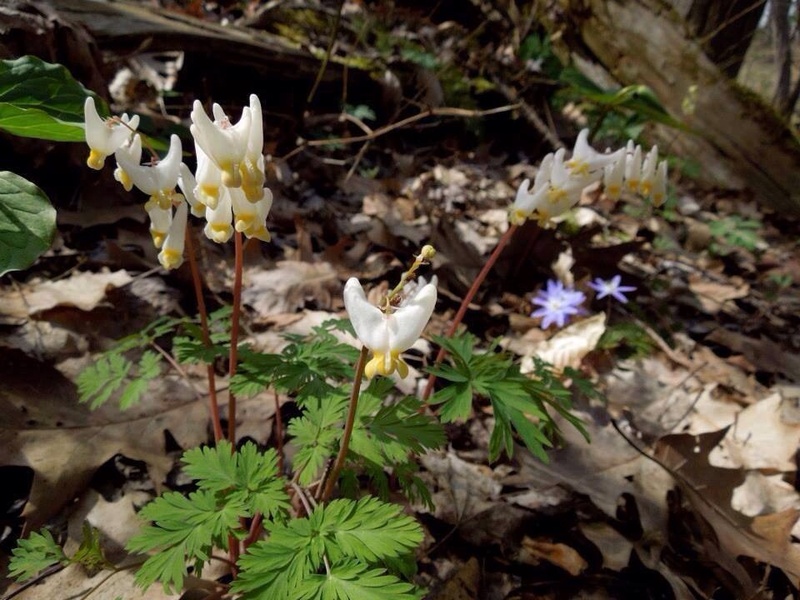 It should be noted that some species such as those belonging to the genus Dicentra, do not have these associations. In this situation, these species do in fact develop extensive root hairs as a coping mechanism. Despite specific adaptations for nutrient uptake, you will rarely find spring ephemerals not growing in deep, nutrient-rich soils. Again, we must keep in mind that all of this is happening so that the plant can quickly complete what it needs to do in the few weeks before the canopy closes and things heat up. It has been observed that high temperatures are associated with slowed growth in most of these species. As temperatures increase, the plants begin to die back. Another adaptation to this ephemeral lifestyle is an increased ability to recycle nutrients in the leaves. As spring temperatures rise, the plants begin to pull in nutrients and store them in their perennial organs. They also show specific compartmentalization of energy stores. In many species, seed production is fueled solely by energy reserves in the stem. Some underground storage structures then receive nutrients to fuel autumn and winter growth while others receive nutrients to fuel leaf and stem growth in the early spring. Despite all of these amazing adaptations, life is still no cake walk and growth is painstakingly slow. Many species, like Trillium and trout lilies (Erythronium spp. ), can take upwards of 8 years to flower! 8 years!! Think about that next time you are thinking of harvesting or picking some. Even worse in some areas are white tailed deer. East of the Mississippi their populations have grown to a point in which their foraging threatens the long term survival of many different plant species. Especially hard hit are spring ephemerals as they are the first plants to emerge after a long winter of near starvation. I hope this post wakes people up to how truly badass these species really are. As our climate warms, we can only speculate how things are going to change for many of them. Some research suggests that things may get easier whereas others suggest that conditions are going to get harsher. It's anyone's guess at this point. As populations are wiped out due to development or invasive species, we are losing much needed genetic diversity and corridors for gene transfer. This is yet another reason why land conservation efforts are so vital to resilient ecosystems. Support your local land conservancy today! Spring is here and things are getting underway. Get out there and enjoy the heck out of the spring ephemerals! In a few short weeks they will be back underground, awaiting the next cold, damp spring.